The Small Weave Basket combines the decorative look of wicker with the convenience of easy-to-clean durable plastic. The weave pattern adds a fashionable touch to everyday storage, for items kept out in the open. 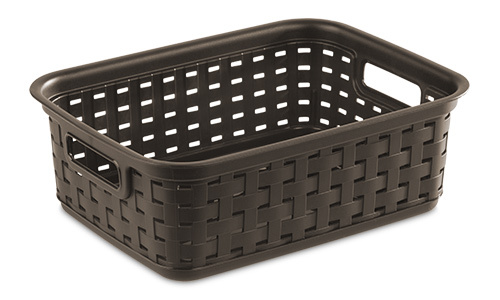 Rectangular in shape, this basket is ideal for reducing clutter on countertops, pantries, bookshelves, entertainment centers and more. 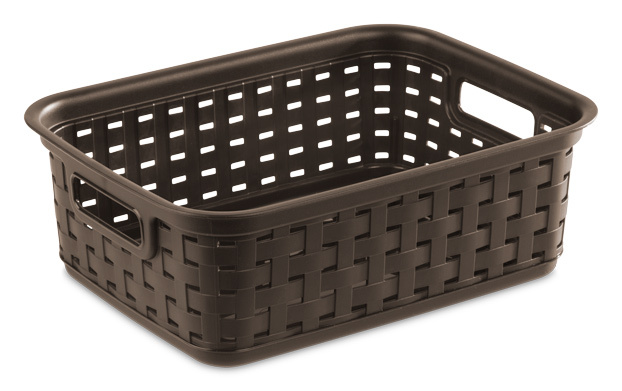 When used with other Storage Baskets, this item can create a customized storage solution that fits any household needs. A reinforced rim provides a great gripping location for lifting and transporting contents. The overall dimensions of this item are 11 1/2" L x 8 3/4" W x 4" H.
Overall Assembled Size: 11 1/2" x 8 3/4" x 4"
The Small Weave Basket is ideal for organizing frequently-used items such as a wallet or cellphone out in the open. Small Weave Basket is rated 4.9 out of 5 by 8. Rated 5 out of 5 by becc from Strong little basket! This is a great little basket that can hold a surprising amount! I was working on an arts and crafts project that involved thousands of tiny metal rings and needed someplace to store them. After piecing the rings together, I placed them in the basket to make it easier to transport them. I could fit over 5000 rings in this basket with no issue, and the basket was even able to carry the weight without buckling. The weave was also nice to look at. I received this product as part of a My-Take research study. Rated 5 out of 5 by aagner56 from Awesome I got this for bathroom items and they work wonderfully! Because they are made of plastic, they wipe clean whenever something spills - which can't be said about most other baskets! The tight weave keeps everything inside and the color matched perfectly with our light grey walls! There is also a space between the handle and the top of the basket to put labels. We used a label-maker to label ours, but you could also tie on a cute tag with a label of what is inside! "I received this product as part of a My-Take research study." Rated 5 out of 5 by Retta from This basket is just what you need. I found this basket to be the perfect size for a number of items. I have filled it with all my art markers and pens. It holds a hundred or more items and it's still easy to pick just the one you want. I love the weave pattern. Besides being attractive, it keeps my pens from falling out. It's nice and sturdy and will obviously last a long time. I highly recommend it! I received this product as part of a My-Take research study. Rated 4 out of 5 by Lissyu from Very sturdy! This basket is strong and very sturdy. I use it on my dressing table for hair blowers and products and it does not bulge or sag under their weight. It’s large enough to hold all my hair products.... and I have a lot of them! I received this product as part of my My-Take research study. Rated 5 out of 5 by jvogelgwu from Living Room Clutter Buster I've used this small weave basket. It has a nice appearance. The dark chocolate is perfect for my living room, complementing my decor. It has a rich look. They are also big enough for me to place board books and assorted toys from my daughter. They are made of sturdy plastic and it seems pretty pretty indestructible, even after getting dropped or kicked by my cats or my daughter. I definitely find these very useful and versatile. I recommend them. I received this product as part of a My-Take research study. Rated 5 out of 5 by Paula from This product was useful in many different rooms I received this product as part of a My-Take research study. I used the basket for a couple weeks. I kept moving the basket every couple of days to different rooms to see where all I could use it. In the laundry room it held clothespins and stain stick cleaners. In the hall closet it had gloves and hats. In the storage area it had lightbulbs and batteries. In the craft room it had ribbons and thread. In the bathroom it had all kinds of toiletries. I liked how sturdy it was and how easy it was to clean if there was a spill. I also liked that items could not fall out the "holes". The handles were useful if I needed to move the items from one location to another. I would like it if the basket could be stackable and in different sizes and colors. Also if a lid could be an option. It was very a very functional and high quality basket. Rated 5 out of 5 by mel98942 from Looks like a real basket and saves space! Im in love with this basket! It has had already numerous compliments from friends as well as family on how it looks great as well as stores items I need organizing. I have used it to keep all my kids wiiu remotes organized and not all over the place! I love how my kids can take ahold of it and it gets tossed around and I dont have to worry. Love the size, look and feel of it! A winner! "I received this product as part of a My-Take research study."